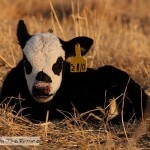 I’m a sucker for white faced calves. 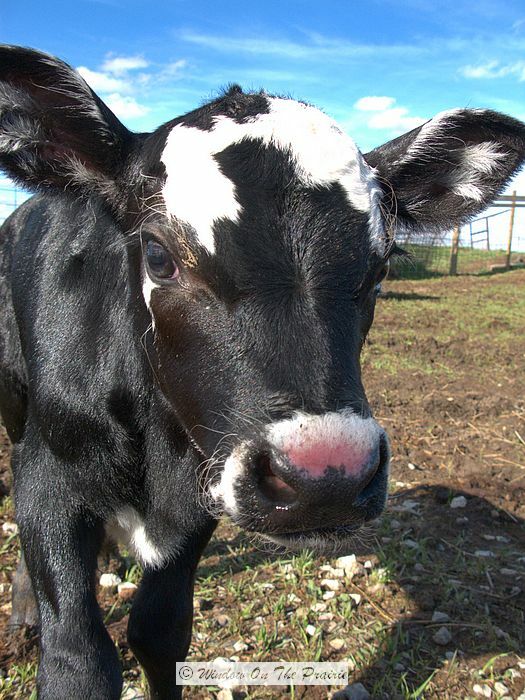 Of course, all calves are adorable with their big eyes, and innocent faces, but white faced calves have a special place in my heart. The majority of the calves were born in March, and were hauled along with their moms to the summer pasture a couple weeks ago. But there are a handful of cows that haven’t calved yet, so they are still in the lot near our house. 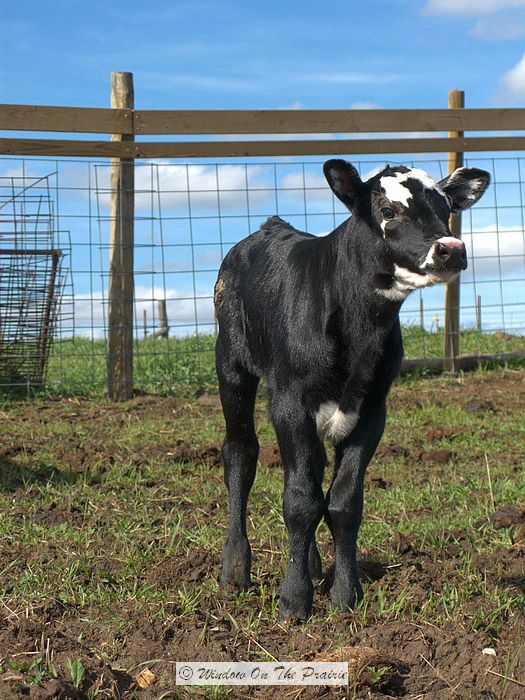 This calf, a girl, was born on Monday. It’s been a busy week, so last night was the first opportunity I had to go take a look at her. She was rather shy at first, and stuck close to her mom, but she relaxed after a while, and her natural curiosity took over. She finally came up to me to get a close look and sniff me all over. 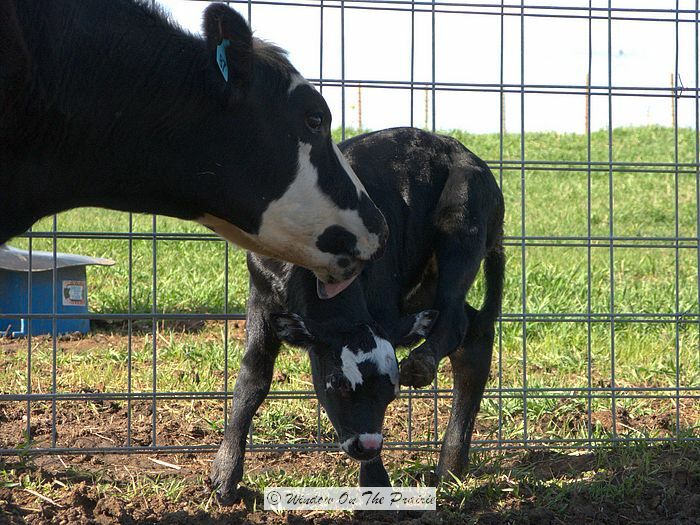 Her mom was not pleased with her baby coming so close to me. After all, I’m one of those pesky humans that can’t be trusted. Mom kept making low mooing sounds to her calf: “Don’t get too close now dear, humans are bad”. 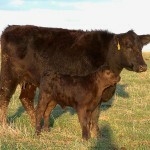 But the litlle calf didn’t pay much mind to her mom. She just couldn’t resist investigating me. I tried to pet her, but she hopped away. Mom cleaned her up afterwards. Harland will be hauling them to a nice grassy pasture this weekend, where they will spend the summer. Was glad I got the chance to get to meet the little squirt last night. Too cute! 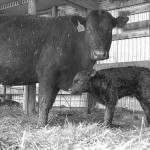 My dad used to put all the baby calves into one of our barns at night when it was going to get way below freezing. I loved opening the door to see all those sweet faces look at me at once. 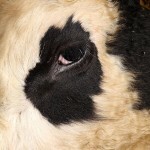 Most were red white faced but there’d always be one or two black white faced somehow. 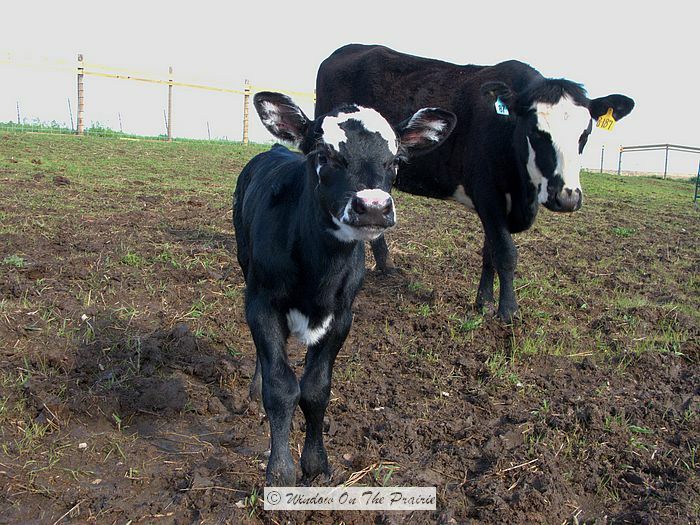 Your little calf reminds me so much of that. Awww….sweet story, thank you for sharing. 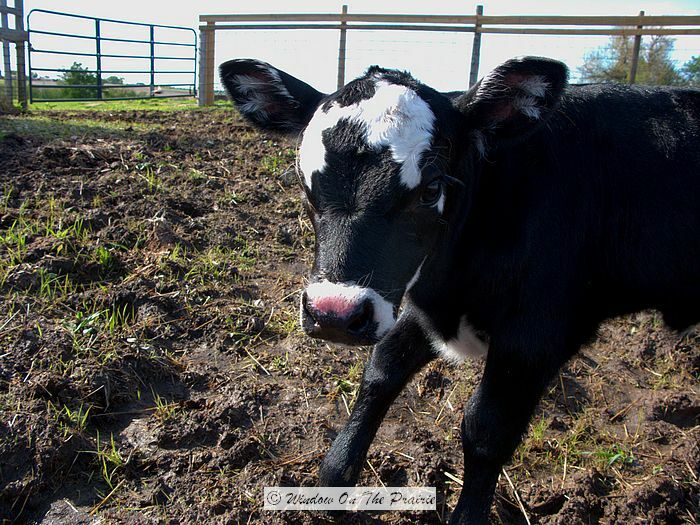 I can just imagine all those adorable calf faces staring at you. Just precious. Take care, and thanks for visiting. When the post said “white faced” I thought for sure a Hereford. 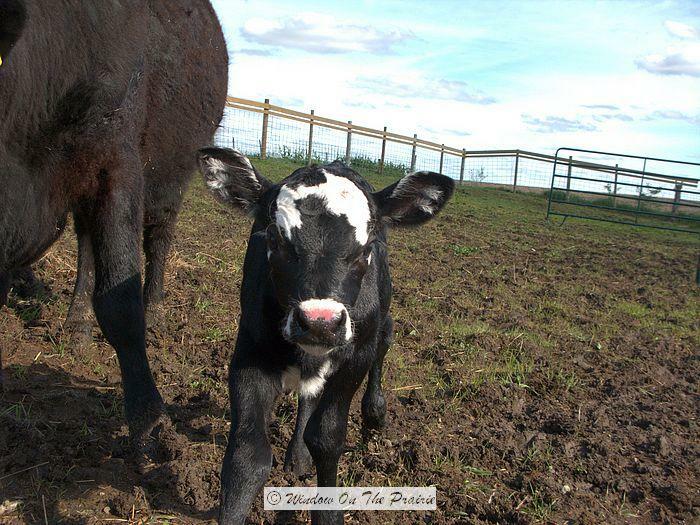 Although it is not a hereford it is cute. Who couldn’t love that face. Love the pics! Well, if it makes you feel better, there is some Hereford in there somewhere. :o) The cow’s mom was a Hereford I believe. Take care, and have a great weekend. What a beautiful baby. Darn those moms for warning their babies not to come play with us. Isn’t she a cutie. 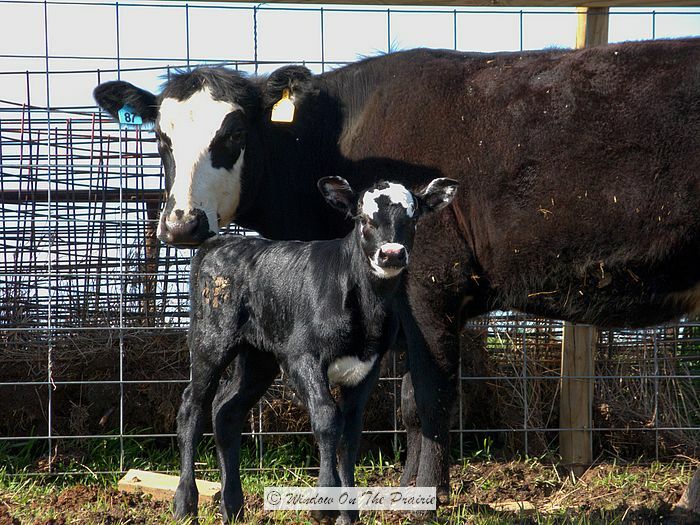 She and her mom were taken to the summer pasture Friday. They’ll spend the summer in grass up to their tummies. 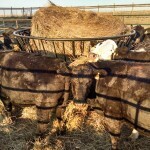 Happy bovines! The baby is so cute. Mommy too. I wish I had a wood cook stove! Thanks again. I get to travel this way. 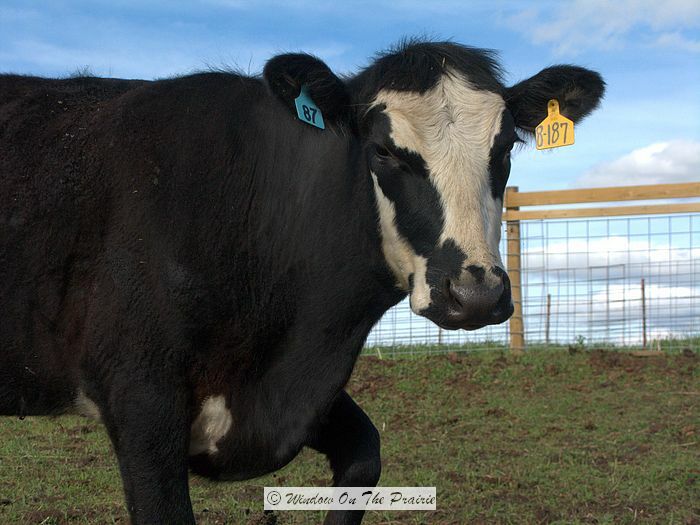 I ran across your blog from Pioneerwoman and I thouroughly enjoyed it. I am a new fan and will continue to read~ keep up the good work!